My Life...Really?! : Oh how time flies!! It seems like yesterday that we were preparing for the arrival of our first child. 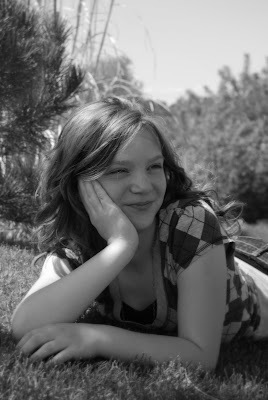 Now we are in the final days of preparing for her to graduate from Primary and move onto Young Women's. This Sunday she will be recognized for completing her Faith in God, memorizing all of the Articles of Faith, and graduate Primary, all on her birthday!!. We are so proud of her!! She is going to have soooo much fun especially in the first couple of weeks. Two days after she turns 12 she gets to attend her first temple trip and do baptisms for the dead. Then it is off to girls camp starting the 22nd! One of the biggest things that she is excited about is that she will be able to experience all of these first with her Aunt Nicole!!! Thanks Nicole for being there for Haley!!! HAPPY BIRTHDAY HALLES BALES!! We love you!! Wow, time does fly! Happy b-day and congrats on all the firsts, Haley. You have grown up into a beautiful young woman, inside and out. You're going to have a blast at girls camp and I'm so excited about you being able to go to the temple - you will love it!!! Happy Birthday Haley! You are such a beautiful young woman! Time DOES fly way too fast! Before I know it.. I'll be in your shoes Sara! I want to thank Haley for being there for Nicole. I love Haley's sweet spirit. She is an incredible young woman. I love everything about her. She is truely beautiful on the inside and out!!! It is crazy!!! I can remember waiting outside your delivery room with my feet up, because they were so swollen from my pregnancy with Conner! It is crazy to think Conner will also be 12 in a few weeks and passing the sacrament!!! Congratulations Haley on your accomplishments and have fun in YW!! !